We produce disc springs compliant with UNI 8736, UNI 8737 and DIN 2093, in addition to a wide range of disc springs having special shape, dimensions, material type, finish, etc. Our technical office allows the customer to study special springs that meet their needs. 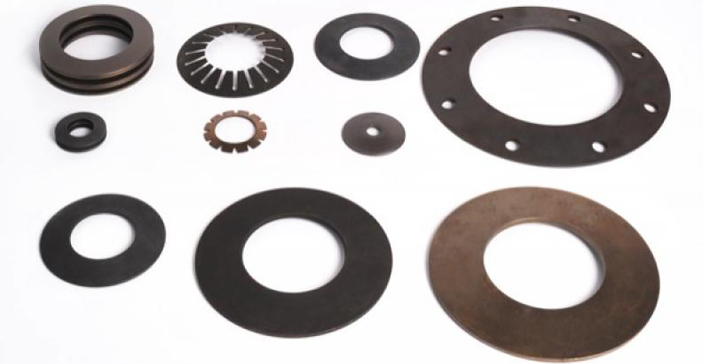 Thanks to water jet cutting system, we are able to produce quickly and at competitive prices, samples and small series. In our warehouse you will find a wide range of standard and special disc springs from the outer diameter 8.0 to the outer diameter 480 mm. Our laboratory can detect and validate dimensional characteristics, hardness, loads and metallographic structures of the materials. Thanks to an appropriate machine we are able to perform fatigue test on disc springs both at room temperature and temperatures up to 120 ° C in oil bath. A plant selection is able to detect the size of the diameters and the magnitude of the load of the 100% of cup springs. The pieces that do not meet the requirements are discarded. A shot peening plant allows us to improve the surface condition of the pieces, significantly increasing the fatigue life of the disc springs. Usually, the oiling phase provides the protective surface finish of our springs, but we can also offer different finishes such as: Geomet, black cataphoresis, mechanical zinc, phosphating process, etc.